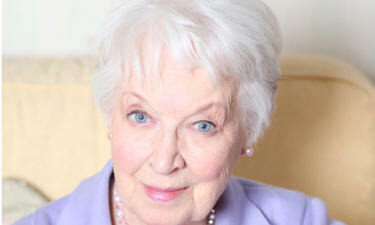 There's only one June Whitfield. This isn't a "broke-the-mould, don't-make-'em-like-her-any-more" platitude. It's more an expression of surprise. She is daintily small, elegant, and immediately recognisable, at 86, as all of the women she has been in seven decades of comedy. In the 50s, at the birth of sitcom, Whitfield was the eternal fiancée Eth, coaxing her dozy Ron Glum towards the altar in radio's Take It From Here. In the 70s, she was the archetypal housewife in Terry and June, whose husband was a middle-aged schoolboy. Ab Fab returns to television on Christmas Day at 10pm, celebrating the show's 20th anniversary, with two more shows to follow – one scheduled for the new year and another to coincide with the Olympics. "It was absolutely fantastic to get back with the team," Whitfield says, "really like beginning another term at school. After saying hello, it was as though we'd never been away." The episodes were shot in September, when friends of Saunders were still deeply anxious about her recovery from breast cancer. With the illness by now in remission, "she was quite remarkable, in very good spirits, and her energy was just fantastic," Whitfield says. "If she goes on that way, she's doing terribly well. "Joanna [Lumley, who plays Patsy in Ab Fab] says that Jennifer is like a sponge. She takes in everything that she sees and locks it away, so she can use it when she needs to. She probably does it with me. I don't quite recognise myself: I don't think I'm quite as barmy as Mother. She's great fun to do. I think she gets a bit battier as time goes by, and of course Edina and Patsy are older, so I should think that makes Mother about 120 – but Jennifer said, 'No, Mother never grows old'." We met at an Oldie luncheon to celebrate the careers of Ray Galton and Alan Simpson, the creators of Hancock's Half Hour and Steptoe and Son. Whitfield featured in both series, including a role in arguably the most famous sitcom episode ever, The Blood Donor. I was expected to give a speech, as their editor, and the prospect was fairly terrifying – just down the table was the next speaker, Jeremy Paxman. To my delight, June Whitfield was seated next to me, and radiated calmness with a hint of military briskness. I began to see why, since she first broke through on television with Bob Monkhouse, in The Passing Show in 1951, she has been the stalwart of so many nervy performers. In fact, she has co-starred with almost every major comedian since the war. Roy Hudd, a long-time collaborator, calls her affectionately, "the comic's tart". "I have worked with quite a few, I must admit," she says. Frankie Howerd, Peter Sellers, Tony Hancock, Jimmy Edwards… none of them, I suggest, had a reputation for mental stability. Were they all bonkers? "No, no, no, but the trouble is they have such a weight on their shoulders. If you're the star of a show, the next one has to be as good or better and if you're doing a series, if anything goes wrong it's your fault. There's nobody else to blame." The accusation that such comics were perfectionists was unfair, she says. They were simply striving to produce their best because the public would accept nothing less… and if another cast member was shirking, they would react. Whitfield's effortless professionalism kept her safe. "I've always said one of the reasons I've worked for so long is that I'm no trouble." By the time television discovered her, she had already tasted fame with a national theatre tour, co-starring with Wilfred Pickles, then a household name. Noël Coward visited her home for a party, and played the piano, during a West End run of his musical Ace of Clubs, where she was playing a nightclub dancer. But it was Monkhouse who first came to rely on her in his TV act. "Bob was always bright as a button, and he had a computer for a mind. It just stored everything away I believe the only way he could stop it from constantly ticking was to take to his bed and have himself knocked out, once or twice a year." She went on to work with Arthur Askey, "who was always on – he always had a funny reply or a riposte". The experience, on a show called Arthur's Treasured Volumes, which taught her an invaluable technique: how to laugh without being seen by the camera. That skill saved her when she worked with Morecambe and Wise, in a 1974 sketch called Plantation of Passion. Eric Morecambe had a reputation for making guest stars corpse. "It was absolutely hysterical. We were supposed to be in the jungle, and every time I heard the drums I had to go into a sort of shimmy. Eric was wearing shorts and until the actual recording I hadn't really seen them. When he sat down, they were wired and they shot up at the front. I mean, that was killing. Hopefully the camera isn't on you at the time, so you can have a smirk and be over it by the time it's on you again." She has worked occasionally in film, including four Carry On movies spanning 33 years, from Nurse in 1959 to Columbus in 1992. She prefers television: "I'm always up for cinema, and then you hear that actually the location is in a very cold place with all the attendant discomforts, and TV is much cosier and warmer." Her most famous role was in the archetypal suburban sitcom marriage, with Terry Scott in Happy Ever After, which became Terry and June. Her husband was an excitable, delusional, overgrown Boy Scout, a middle-class fuddy-duddy on amphetamines. Whitfield was resigned to clearing up his messes, and deflating him if his pomposity threatened to suffocate her. "I'm sure some marriages do work like that. A lot of people thought we were married, and obviously that was some kind of a reflection on their own lives, though of course we'd claim it was down to our brilliant acting. I used to say that if I talked to my husband the way I talked to Terry, I'd be out on my ear. But Terry was so pompous, he'd deserve everything you'd say. "In real life, we got on like a house on fire. Terry used to say, 'There's nothing I wouldn't do for her, and nothing she wouldn't do for me, so that's what we do for each other… nothing!' Sometimes he would give me advice on acting. "He'd say, 'I think you should do it this way,' and I'd say, 'Oh yes, fine.' And then I'd probably do it exactly as I had before, and he'd say, 'That's better!'" Whitfield sometimes regrets that the traditional roles of husband and wife have changed so much since the 70s. "Nowadays, at the first sign of an argument, they leave each other rather than trying to work things out. People are inclined to take the easy way out. Men have been domesticated and I don't think it's necessarily good for them. They have been emasculated, with the pill and women becoming more independent. I do think it's made a big difference for women to have more charge of their own bodies. It's made them feel more on equal terms and made the men feel less secure, less the master of everything." Her own mother, "Muff", was a keen amateur actress and would have loved to have made a career of it, but her grandfather wouldn't hear of it: "He said it was all full of rogues and vagabonds, the theatrical profession." Instead, she dedicated herself to am dram, both on stage and as a director, almost until the end of her life. "Sadly, when she had to stop, that hastened the end, because then she hadn't a lot left to live for. That was her life. And I always think I've stopped at the end of every job but, touch wood, something turns up." Next year Whitfield will star in a radio series written by Andy Merriman, the son of one of the writers who created Happy Ever After. She clearly has no thought of retiring. Too many comics are relying on her. Christopher Stevens is the editor of Ray Galton and Alan Simpson, The Masters Of Sitcom: From Hancock To Steptoe, (Michael O'Mara Books, £20).